Rock out once you've made sales with this organized, ready-made, helpful email database of singers, which contains all of contact information you need to reach out to a powerful group of music-focused entrepreneurs. We've pulled this spread-out group's information into this one B2B email list! Convince a huge group of vocalists and artists that your brand rocks with our professional singer email list. Don't sing out of tune when connecting with the wrong kind of B2B contacts; make sure your campaign and target audience are in harmony by focusing on the exact group that would be most interested in your products or services. Folk artists, pop sensations, opera singers, and numerous vocal performers all need professional tools and help to make their songs as beautiful as possible. Let them know about your musical product, software, booking service, or helpful tool. If you have a musical product to sell, a business mailing list of the targeted contacts of music-oriented professionals like this would be an ideal choice. 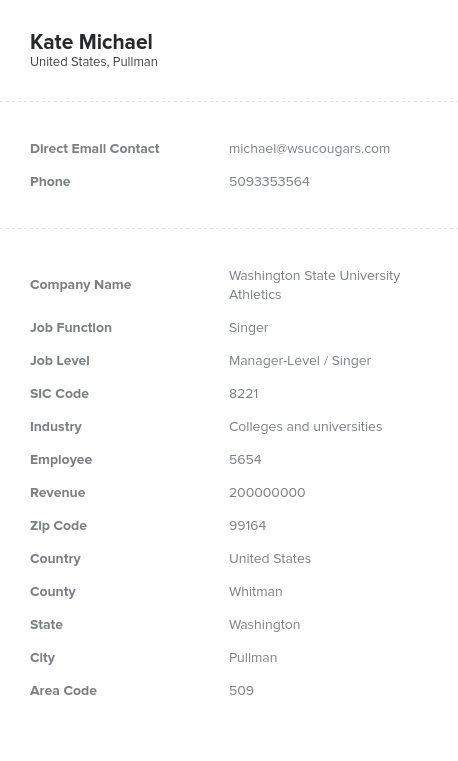 Our vocalist email list is full of all of the contact data you need to strike a chord: singers' email addresses (real ones rather than generic ones), postal addresses, fax numbers, phone numbers, and relevant company information. You don't need to buy singers' emails separately; you can get all of the information in one business database. Start communicating directly with these musical entrepreneurs by calling singers using these phone numbers, or use our directory as a singer mailing list for mass mailing. Send them a sample of your technology or let them know about a free service over email. With our email list of singers, there are so many ways to make music together! Download it today.